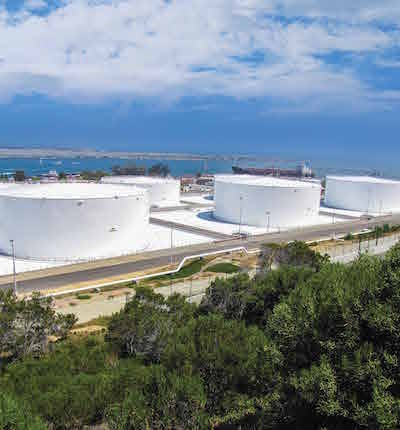 In recent years, these facilities were retrofitted with a reinforced ethylene copolymer alloy geomembrane for the bermed areas and reinforced polyurethane membrane under the floors of the tanks themselves. The exterior membrane was left uncovered because it made operation of the facility and the containment area simpler from an operation and a storm water management perspective. 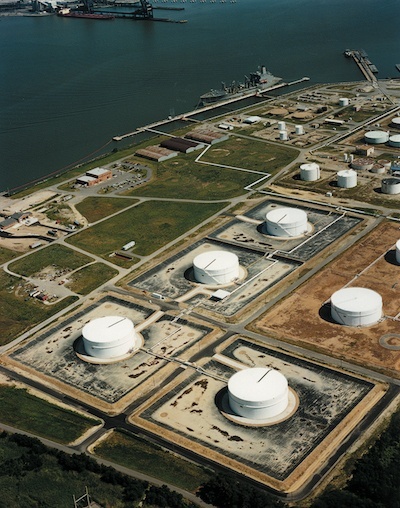 The XR-5 geomembrane utilized had a negligible coefficient of thermal expansion and contraction so connections were secure and the material itself was not subject to diurnal stress cracking. 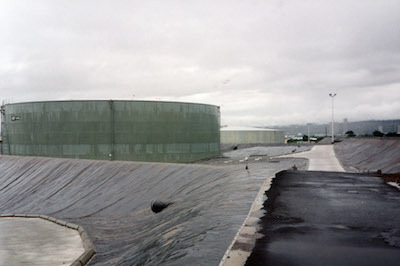 Field seams at these facilities were one-fifth that of unreinforced polyethylene products, due to the flexible nature of the XR-5. Fuel resistance and equally as important, fuel permeability, is extremely low with the material selected for all three facilities. While a product may not deteriorate in the presence of fuels, that does not mean it is not permeable and will allow it to pass at a rate much higher than other materials. In this case, the US Navy chose a material that excelled in both measures. Further, a designer must consider if a reinforced product requires that the reinforcing be isolated so there is theoretically no fuel contact. The best way to get around that issue is in the manufacturing process, by saturating the reinforcing fibers so there is no attack by fuels. Then, any minor damage during installation or operation that exposes the reinforcing does not cause a system failure. Concrete, asphalt and clay all have inherent negatives for these applications. Concrete is permeable to fuel, asphalt is destroyed by fuel, and clay must stay wet in order to provide a barrier. Utilizing an exposed geomembrane is more economical, provides more operational flexibility and maintenance and is more reliable. Fuel resistance and fuel permeability are not the same and are both important. State-of-the-art reinforced geomembranes are constructed with fuel resistant reinforcing. Consider the long-term for large scale spill containment. Learn more about XR Geomembranes for secondary containment liners and request a sample here.